The Buddha is seated in the classic meditation pose known as virasana, or heroic posture. An impassive and still figure, he is completely absorbed in a trance-like meditation. Several supernormal features indicate his divine status, including his elongated earlobes and his small, curly locks of hair. The Buddha you see here, carved from marble, is stripped down to the barest essentials. Its simplified human form seems to have renounced detail together with adornment. A single spare line, almost lost in the white marble, defines a robe thrown over one shoulder. Knees and elbows are unarticulated curves. Such simplicity seems to reflect the Buddha’s disdain of things material. 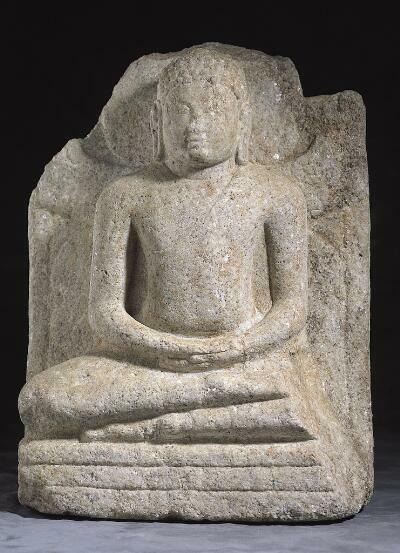 This statue comes from Sri Lanka, an island nation to the south of India, where Buddhism has flourished continuously from the 3rd century B.C. The spread of Buddhism to the island is credited to the Indian emperor, Ashoka, who is venerated as a kind of Buddhist Constantine. Ashoka sent his son to Sri Lanka, it is said, to spread the Buddha’s teachings. His daughter brought the Sri Lankans a branch of the bodhi tree that sheltered the Buddha when he achieved enlightenment in India. The offshoots of that tree are still worshipped in Sri Lanka today.